Work Space and Office Creativity: Does Size Really Count? How much space does an employee need in order to be able to think creatively when required or encouraged to? Which matters more: the size of the space, or its quality, e.g., (un)cluttered, sound-insulated or free from unexpected distractions and hazards? A recent joint U.S.-Chinese experimental research study published in the journal Psychological Science and reported in the U.K.’s Daily Mail concluded that the size of the space made available to employees strongly influences their capacity to “think outside the box” and to devise creative responses to challenges. The researchers reported that employees given creative-thinking tasks did better when allowed to do so outside the confines of a 5 ft x 5 ft cardboard box (the third dimension not was not specified in the article) that, despite being characterized in the Daily Mail article as “cramped” and “claustrophobic”, was supposedly designed to prevent claustrophobia among subjects tested inside one. Apart from its suggestion that, when it comes to creativity, size matters, what makes the study attention-getting is its intense focus on the size of available employee space, rather than or also on the quality of the space, including the amount of undistracted, peaceful, uninterrupted time afforded within it. Take a look at the office of the genius whose name is synonymous with creative brilliance (and deep analysis of time as well as space, which he creatively and conceptually synthesized as seamless “space-time”): Albert Einstein: There is virtually no available working space on his desk surface, most of it being occupied with heaped documentation and notes; the blackboard is, by common teaching standards, small (certainly much smaller than any I’ve ever seen in any classroom in which I’ve taught or studied), with barely enough room for one more Nobel Prize-winning equation (perhaps one he missed for want of space, if not time). One very important psychological and cultural consideration is the distinction between personal psychological space and personal physical space, given that these two kinds of space do not necessarily uniformly correlate with each other across individuals, situations and cultures. Someone socio-phobic or simply introverted may require a very different well-shielded and/or larger space than others in order to feel comfortable enough to even think calmly and clearly, much less creatively. Hence, creative output under the stress or stimulation of being in a small cardboard box or cramped office workspace (but not so cramped as to cause cramps) can be expected to vary considerably over individuals with different psychological and/or cultural profiles. Moreover, the size of the space may matter less than how it is demarcated and how its boundaries, walls and partitions are interpreted. Imagine a cubicle with partitions—yours, if you have one. Although it is quite small it is insulated and private, to the extent that its partitions shelter you from visual observation, other voices and other (un)welcome distractions. If size mattered most, removing those partitions should not substantially impact your performance. But it can, and substantially. It certainly would impact mine, e.g., if the frequently flashed engaging smile of my knockout workmate compounded the milder distraction of the subtle fragrance of her wafting Chanel. Likewise, the insulating walls of older phone booths defined the function as well as the boundary of the phone’s space: to keep conversations private, their size being pretty much irrelevant to that all-important function. So, think of workspace efficiency, including creative efficiency, as being as much at the mercy of the presence or absence of walls as conversational efficiency is in phone booths (when forced whispers and waits for more privacy can compromise the communication). Otherwise, imagine a toilet space with and without walls. Size, it seems, matters much less than researchers might imagine. Clutter or the lack thereof as a prerequisite or consequence of creativity can have the same impact. Apparently, Einstein thrived on it; it would freak me out and paralyze my mind. Again, it’s not only the size of the space that can count, but also its subjectively-assessed quality. So, why did the researchers find creativity inhibited by being in a cardboard box? My guess: because it was a cardboard box. Apart from any mental disorientation and distraction caused by being asked to sit in a box (cardboard or Skinner), which can inhibit creative thinking, if I’m put into a box like that, its walls may just as easily represent creativity-stifling obstruction and suffocation as distraction-proofing insulation—it depends on which impression prevails. If the walls look like they are obstructing my literal and creative vision or limiting my physical/psychological freedom (of thought and imagination), I would expect my creative thinking to take a bigger hit and be much more impaired, if at all, than if I saw the walls as insulation from distraction. A key parameter in determining how this mental coin toss will turn out and how to allocate and configure a work space is whether the employee is primarily anxious about being socially, physically or mentally isolated, or, instead, about being figuratively or literally suffocated or interfered with—a distinction also deeply relevant to understanding one’s partner in marriages and romantic relationships). A second crucial dimension is the question of how competitive and/or cooperative the office creative genius or task are, since the more competitive the employee or the task, the more likely privacy in the form of greater distance or higher and thicker walls will be desired and desirable. I suspect that insulation-obstruction dichotomy will be crucial for many other people: A key consideration is whether the blocking of interactions by the features of the space triggers a sense of blissful insulation that can catalyze creative thinking or triggers a sense of obstruction or restriction of literal and figurative “vision”. It is also quite likely that, depending on one’s mood, metaphors and the moment, an identically configured, sized and bounded space may inhibit or stimulate creativity as the perception switches from insulation to obstruction, making the physical size of the space a secondary consideration at best. If the study’s research results are taken at face value, employers should consider expanding the open space available to their creative staff and get them out of small cubicles—partitioned or otherwise. On the other hand, if the quality and subjective interpretation of the space matter more than size, the wiser course may be to concentrate on ensuring that partitioning is provided only when the employee wants and will creatively benefit from insulation—a cheaper strategy, given that per square foot vertical partitions are going to cost a lot less than usually very pricey office floor space. What’s more, a lopsided emphasis on size seems likely to be counterproductive in some common workplace circumstances: If the kind of creative thinking that is required is individual, then probably the more space and more partitions the better—although not necessarily. On the other hand, if the creative thinking is more like group brainstorming, the less space and fewer partitions the better. That’s a key distinction—individual vs. group creativity—and one that should be reflected in the space design and configuration. Hence, the advice to open up and expand work space by increasing its size and by making the space more “porous” by decreasing its walls in number and size can conceivably backfire, unless the goal is group brainstorming. 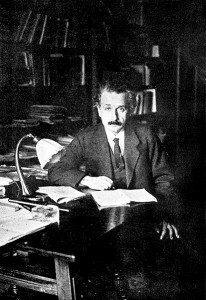 Ask yourself this: If Einstein were working for you, which format would you provide him—insulation from those around him or porous interaction with others, including, but maybe not only, geniuses? Or would it depend on whether he was working in a Swiss patent office alongside lesser minds (which he did)— where he spent time thinking about ideas deserving a Nobel Prize (which he won for that thinking), or in a meeting of the Manhattan Project atom-bomb team comprising the top scientific minds of his time? 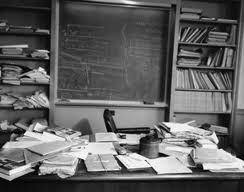 Judging from the chaotic appearance of his desk, which suggests that, for him, clutter was catalyst, what for some would be the cluttering distraction of other minds would, to him, present just one more way to be brilliantly creative.